Features: Comfortable low-noise operation High-speed drying and low-noise operation have been simultaneously achieved using an advanced wave-shaped nozzle and innovative flow control technology. Multipurpose operation mode selection Choose from two operation modes selectable using the power control switch (easily set using LED display). Operational parts are installed in the body and a lock function is incorporated to prevent tampering. Spacious hand-drying zone The hand-drying section is wide for easy use by people with large hands. 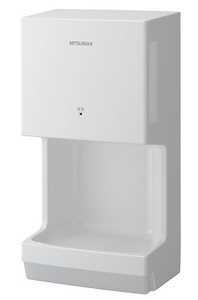 Hygienic touch-free operation enables drying hands up as far as the wrists without touching the unit. Range sensor and blue LED indicator adopted for comfortable drying A blue light indicates the hand-drying section when hands are inserted, contributing to ease of use. Antimicrobial treatment/Alcohol-resistant resin All parts that come in contact with water, such as the hand-drying section, drain tank and drain ducts, have been treated with an antimicrobial agent, and an alcohol-resistant resin has been adopted for enhanced hygiene. 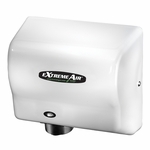 Integrated unit ensures simple maintenance The one-piece design with the sensor window integrated into the hand-drying section and minimal joints in the body prevents the accumulation of grime and is quick and easy to clean.